Happy New Year! 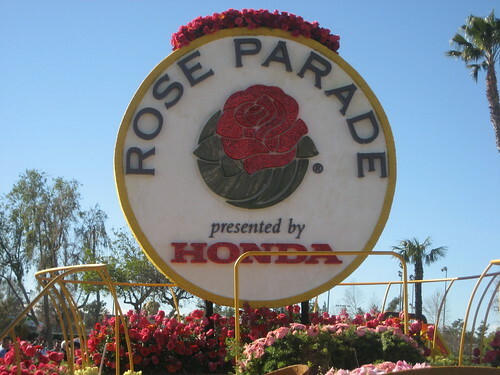 Every year on January 1st (or January 2nd in this case), we go check out the post-parade viewing of the Tournament of Roses Parade in Pasadena. 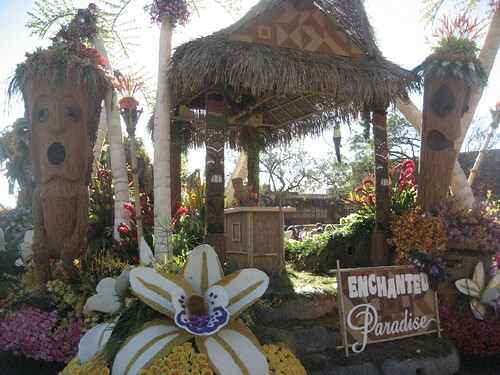 Two years ago I blogged about an under-the-sea themed float with a neat school of pufferfish, but this go-round there was a bonafide tiki float! 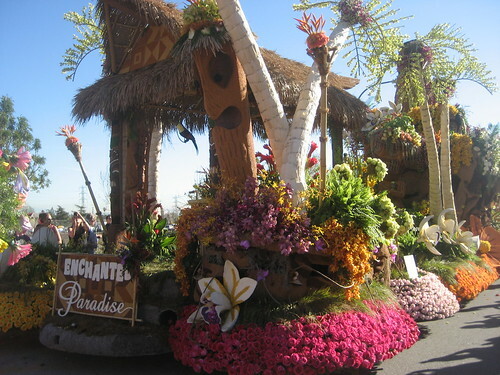 The City of Downey’s float was called “Enchanted Paradise” and it won the Founders’ Award, which is given to the most beautiful entry built by volunteers (as opposed to the professional float-building companies that make most of them). 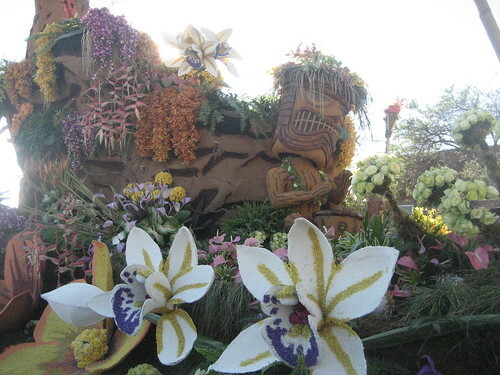 The float featured a volcano that actually erupted fire, three tikis, a thatch and bamboo hut with tapa-style designs, parrots, palm trees and giant orchids. 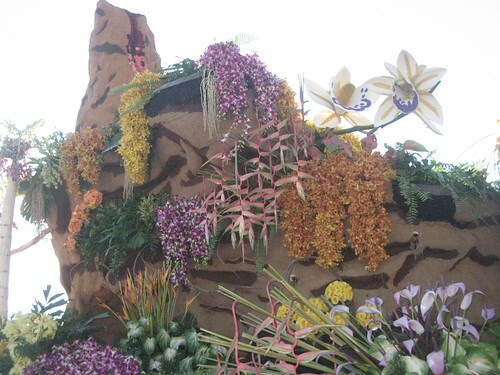 I loved the flowers on the volcano, especially the garlands of orange mini orchids and the “lava” flowing down from the top. 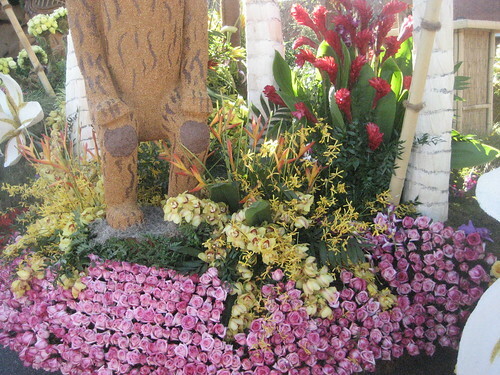 The audio tour said it was covered with sheet moss, Spanish moss and reindeer moss, and that the rest of the float had thousands of roses, anthuriums, carnations and ginger. 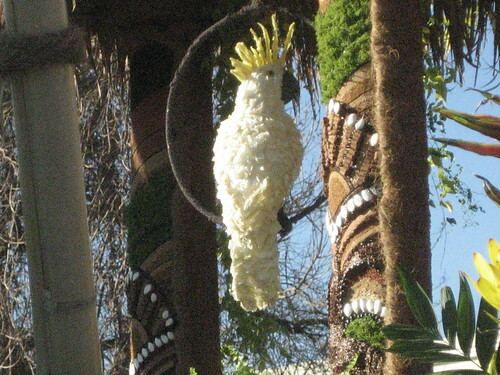 All the floats have to be covered with natural materials, so this “cockatoo” was coated with white and yellow rose petals, and onion seed for the beak. 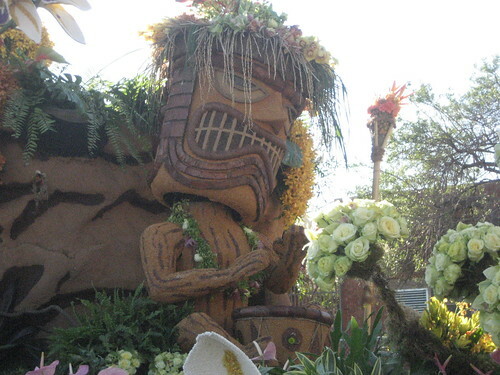 During the parade this tiki moved its arms, playing the drum. 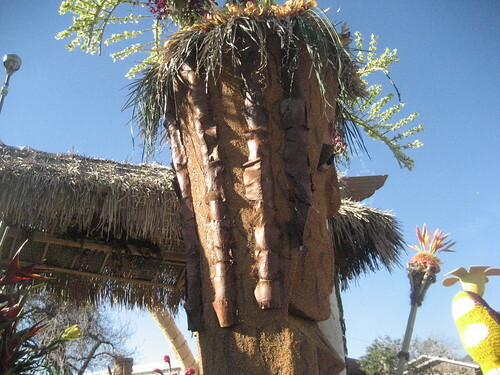 According to Stephanie Edwards on KTLA, the tikis were covered with bark, barley, mum, walnut and strawflower. 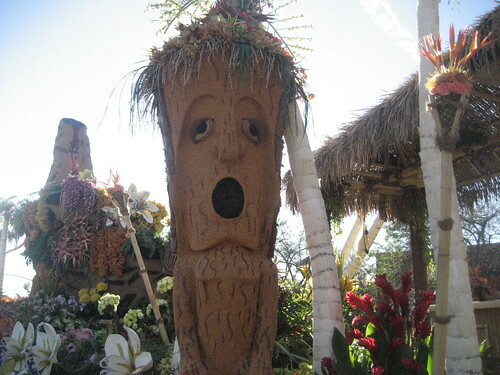 This sleepy-looking tiki was spewing out smoke during the parade. 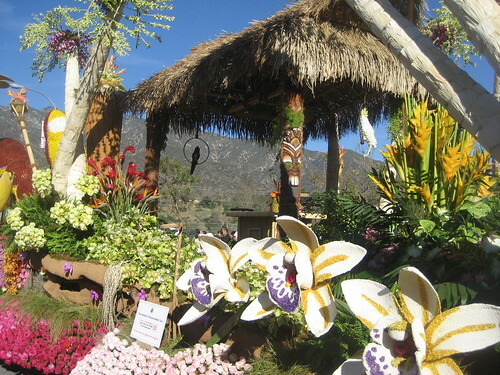 I love the “tiki torches” next to it — bamboo poles with whole pineapples, pink carnations and heliconia for fire. 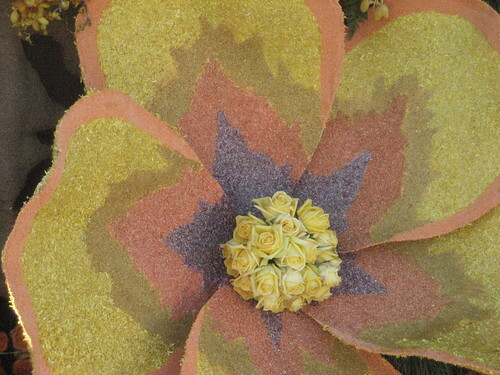 One of the volunteers said that all the tropical flowers (i.e. not the roses or the mosses) had been flown in from Hawaii the previous week. It’s interesting to me how they make something — like a palm tree — out of something else — corn husks and orchids. Palm fronds instead made it on to this tiki, giving it a cool texture. 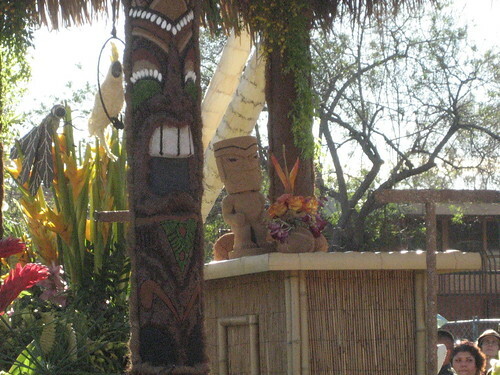 I liked that the float designers “carved” tiki masks into the support poles of the hut, using squash seeds for some of the white details. That’s a pretty nice bamboo bar they have up there, too — only thing missing is the rum! In case you missed it on TV, you can see video of the City of Downey’s tiki float and all its moving parts on the KTLA web site (around the 2:45 mark). Milestone Products is also selling Rose Parade pins featuring the drumming tiki for $6. Check out more of my photos of the float over on Flickr. Thanks for posting those photos of the Downey float. I had looked online for them, but didn’t find anything remotely close to how great your photos were. Great photos! All the best to you in 2012! Mahalo, Marty! Right back at ya. Roxanne of Dolphin WaterSlides, Inc. Thank you for the posts on the Float. We actually built the water slide that was incorporated in the float and have been looking everywhere for video of the float. This pictures are great! Thanks, glad you were able to find them. Great handiwork! Very cool! I’d love to hear more about the materials you used.